STATEGY. 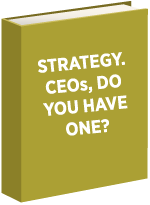 CEOs, DO YOU HAVE ONE? No one elects to follow a bad strategy. Smart business leaders understand it’s importance. They know a sound strategy will help align decisions and get their teams headed in a unified direction. Yet too few can articulate their strategy, and others struggle with it.